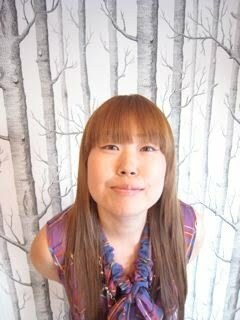 I’d written before about the personal style of my friend and hair stylist Fumi (see the earlier post here). But I just had to write again after learning that Fumi has recently left her post at Salon de Quartier on Smith Street to strike off on her own. She’s sent me pics from her new salon, located at 121 3rd Street in Brooklyn, in what I think is the up-and-coming Gowanus neighborhood. In fact, I’ve spent quite a bit of time around these parts, exploring the neighborhood whilst killing time as Fionn slept in his stroller … I’ll post more of my finds in a future post. 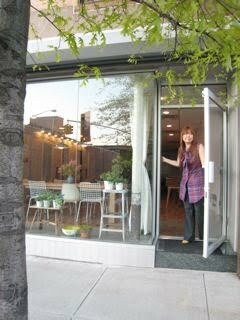 I wanted to share these photos because it seems she’s incorporated her altogether unique and organic Japanese-meets-Scandinavian style in this space. I must admit I’m terrible with plants because they always look so -lonely- and somewhat unnatural (!) in my apartment, but I love the mini-tables she’s used to house them. 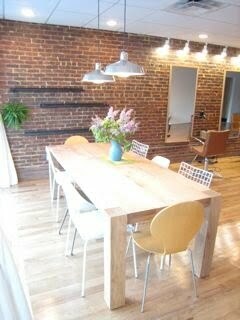 The centerpiece of the space has got to be this heavy duty craftsman oak table. I love the use of somewhat mismatched, various chairs and the task lighting that hangs above. 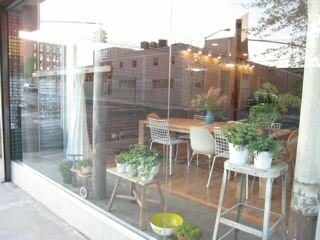 Fumi says it’s her favorite piece because it gives the salon a Scandinavian cafe-feel. And if you haven’t seen this wallpaper before, it’s one of my favorites. I’ve seen it in a variety of very different settings, and it really does adapt to fit the mood of the furnishings around it. It’s another Anthropologie home-decor find and is really beautiful in this setting. 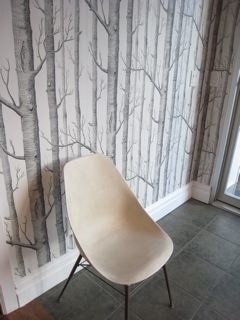 The tree outside matches the wallpaper inside! If you are interested in getting in touch with Fumi, she wanted me to pass on her new phone number. It’s 347-763-0413(0414). Congratualtions again, Fumi – I can’t wait to visit you in person.